Corn begins to pop up through soybean stubble on this Iowa farm. Reside left from the prior year's crop helps build organic matter in the soil, which helps build overall soil health. The United States Department of Agriculture is set to release the 2013 report of agricultural land values on August 2. If trends continue as they have been for the past 10 years, then the value of agricultural land – especially in the Midwest region – will see a continuing increase. The last published report released August, 2012, shows a marked increase in cropland values for the Corn Belt region ($5,560) nearly twice the national average ($2,650). The U.S.D.A defines the Corn Belt region as Iowa, Missouri, Illinois, Indiana and Ohio. 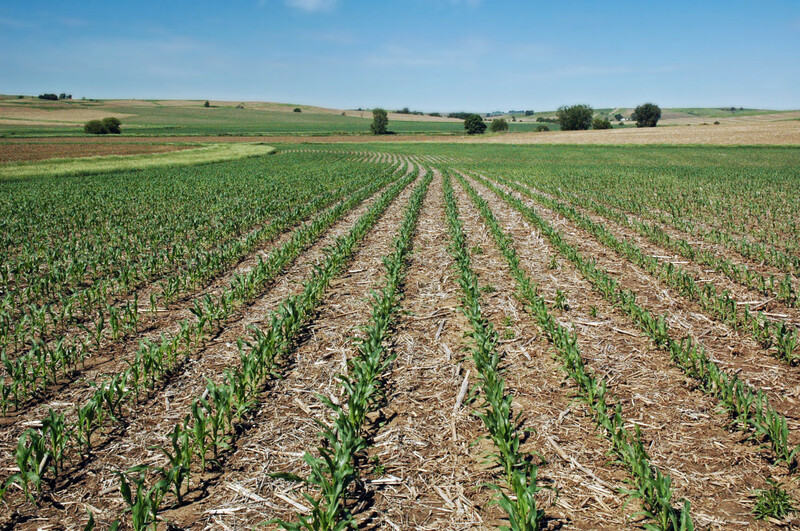 Meanwhile, agricultural land value in the Southeast region showed a slight decrease in value (7 percent), pasture values increased (4.5 percent) and Northern Plains showed the largest increased (21.9 percent). States in the Southeast region include Alabama, Georgia, Florida and South Carolina. And states in the Northern Plains region include North Dakota, South Dakota, Kansas and Nebraska. Coverage Farm real estate and cropland valuations in in the Northeast, Lake, Corn Belt, Northern Plains, Appalachian, Southeast, Delta, Southern Plains, Mountain and Pacific regions of the United States.